Like the fig tree, the grapevine sleeps a little longer. But soon the leaves will appear, later the grapes - and eventually - come autumn - there will be wine. Such a wonder, don't you think? 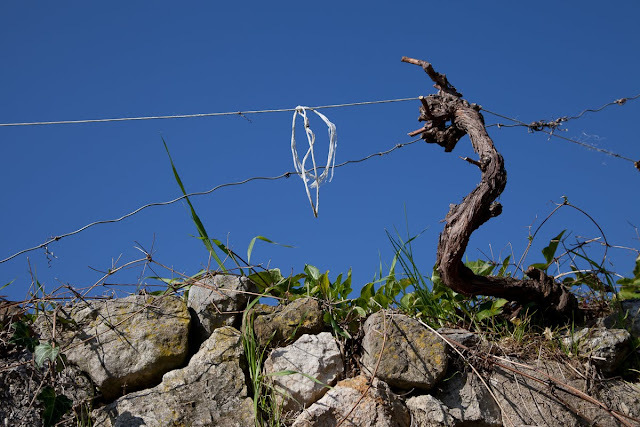 Comme le figuier, la vigne sommeille encore un peu. Mais bientôt les feuilles vont apparaître, ensuite les raisins - et finalement - en automne - il y aura du vin . C'est une merveille n'est-ce pas? The bigger wonder is how the vine looks like a dancing lady! i'll drink to thank...but perhaps in the autumn of this day rather than the spring of it. It is indeed a wonder. At this stage, it looks quite dead. But you and I know better . . . I'm very much enjoying this series, Jilly. Sorry I've been so quiet!